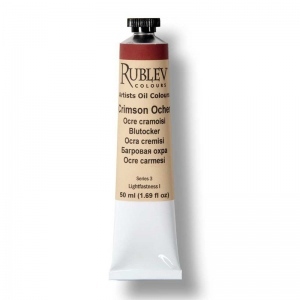 Rublev Colours Crimson Ocher is a semi-opaque deep red with purplish-pink undertones, medium grained, average tinting strength and brushes "long" in the direction of the brush stroke. 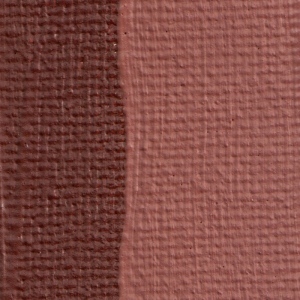 The red earth comprising Crimson Ocher is Crimson Ocher pigment from quarries in Lori province of northern Armenia. 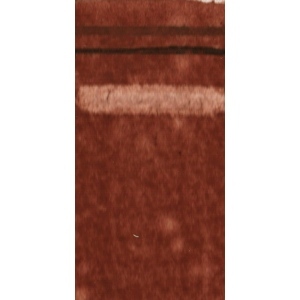 Red iron oxide or ferric oxide is the principle coloring agent in red ochers, such as Crimson Ocher. 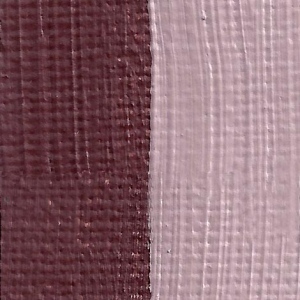 This color is based on the natural mineral hematite associated with varying proportions of other minerals such as clay, chalk and silica. They differ from other ochers in that they do not contain water bound with iron oxide. In other words, the iron to which they owe their color is iron oxide not hydrated iron oxide.